A wee tiny redhead girl. 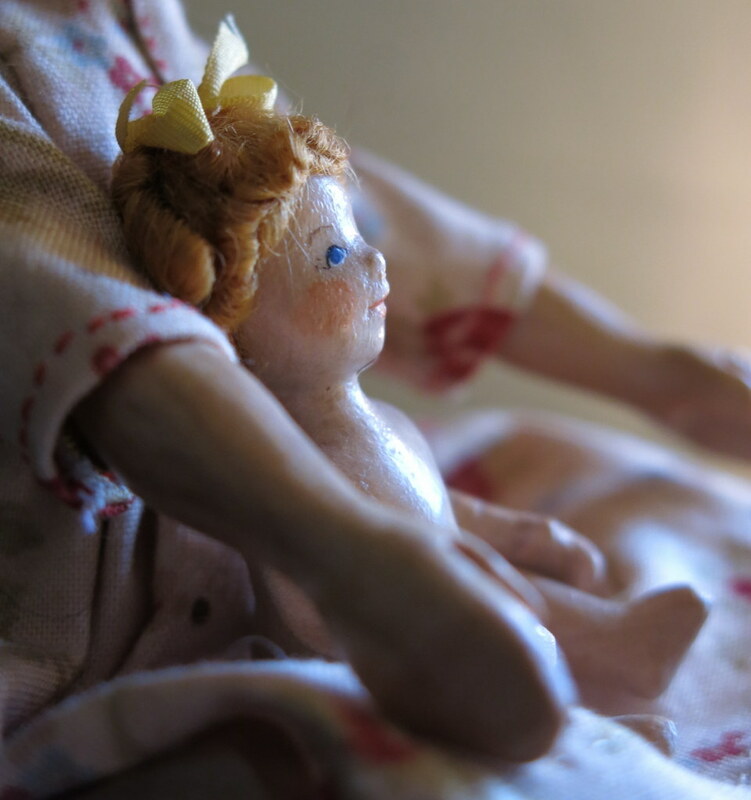 Wee Flora was carved by Judy Brown in 1986! She meandered around until ending up in the Quimper Hitty cupboard just in time for Christmas 2016. The first order of business is to sew her a tiny layette! 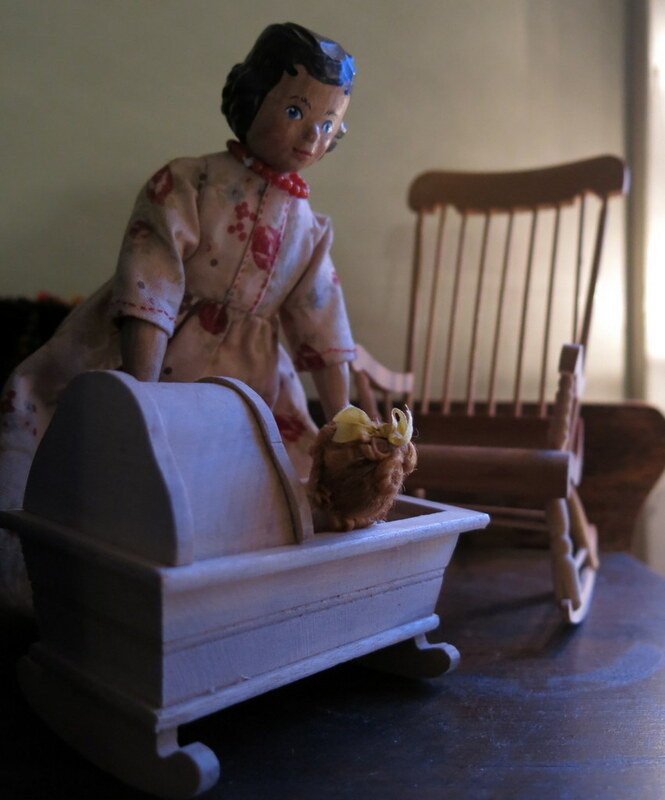 Rose was also carved by Judy Brown, and has lived in the Hitty cupboard since 2011. Click here for Judy Brown’s website. What a darling baby! Judy Brown, you’re a genius! She is a darling baby, and one year older than my oldest child! Judy Brown is a genius! Oh my goodness, she is a little darling! How wonderful she has joined the Quimper Hittys. I am sure she will be very well loved indeed. Isn’t it amazing that she found her way here and onto Rose’s lap! Which one of them is the “big sister” then, I wonder? Wonderful addition to the Quimper family!!! I think she will fit right into the “adventurous” group!!!! Congrats! No doubt she and Gillyflower could find some very tiny amounts of trouble to get into! I think she is very very sweet! Fortunately for the Quimper Hittys, our favourite photographer arranged for her to be sent to us, and were very happy she came in time to be with us at Christmas! Goodness what a sweet baby and such wonderful hair! 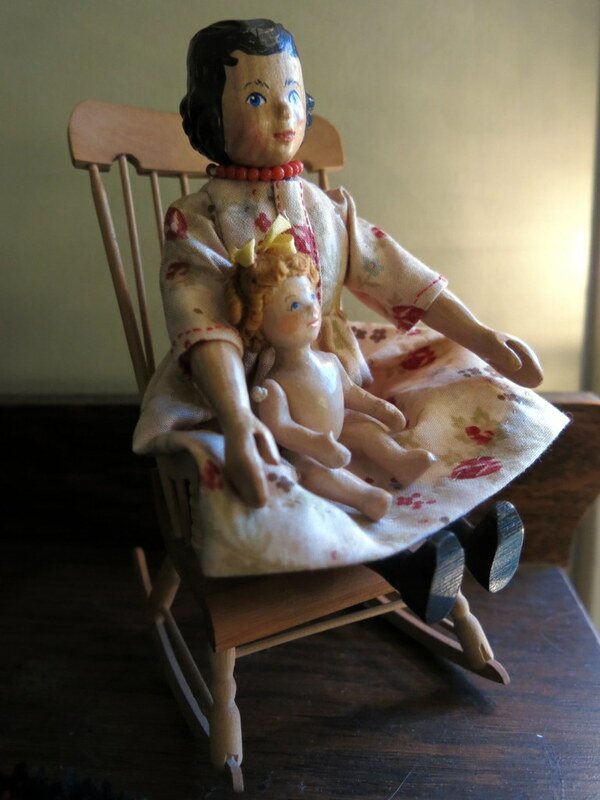 We can work on our layettes together altho my doll is much larger then your sweet little one. I shall be quite interested in what you make for her. I think a blanket first! Then maybe a long gown, booties and matinee jacket! I might have to knit using a microscope for the booties! my thoughts exactly on the layette…except for knitting booties or anything else! My little darling will have to make do with felt shoes I believe. She is precious. I bet Gilly and Flora will have fun playing together. I think so too – they are both so small. Gilly has the verve and mobility, while perhaps age has given Flora the wisdom…we’ll see! she is beautiful, how wonderful she found her way to the Hitty cupboard, Judy Brown must be delighted that she has found such a perfect home. Well done to the favorite photographer. Joy to everyone. The photographer has a good eye! Joy to you too, Flora is a little bundle of it in this house! Flora is adorable. Love her little body, face and hair. She was lucky there was a tiny buggy just waiting for her! I think she is adorable too – she was lucky to come here to live with us and we were lucky too! !